Cherryholmes was the big surprise for us this issue. We'd been hearing about them, but that still doesn't prepare one for the urgency of their sound, or the cogency of their approach. 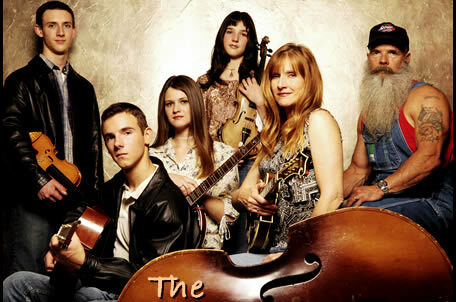 They're a family bluegrass band. They lived in a pretty tough part of L.A.; the parents were strong Christians. After the eldest daughter died in '99, they all went to a local bluegrass festival, to lift the family's spirits. During the course of the weekend, Jere and Sandy Cherryholmes had an epiphany, and decided that this was what they needed to do, start a family band. It would pull everyone together, and give them something they could learn and do as a unit. Although not pros, the parents were experienced musicians, and guided the four kids (there is one more, on his own) down various paths of fiddle, guitar, and then banjo. (Cia was a flatpicker with a new guitar, and she reluctantly agreed to become the family banjo player, since you can't have a bluegrass band without one. Five short years later, she was to be named SPGMA Banjo Player of the Year.) Home schooling was already the family way, so music lessons were simply tacked on to the curriculum. They began playing gigs, and the kids kept getting better, and so did the jobs. Jere and Sandy Lee hold the reins pretty snug--no TV, no Internet, and no headphones. They even listen to music as a family. And the music of the family was Bluegrass; they were living it, especially the classics: Jimmy Martin, the Louvin, Stanley, and the Osborne Brothers, Bill Monroe, Jim and Jesse, et cetera. When the time came, they decided as a family to make the leap to playing music full time, and go on the road with their bus. Their fast and steep ascent in the world of Bluegrass has created a huge buzz nationally on the family called Cherryholmes, and they shocked the industry at the IBMA Convention this year, when instead of winning Best Emerging Artist, they were selected as Entertainers of the Year. Their story is so amazing to me that I decided to write to Oprah Winfrey and tell her staff about this family. If their story and their music turns you on the way that it did us, we invite you to write to Oprah at Oprah.com--there's a place to make suggestions for a future show, and you can make your Cherryholmes pitch. But now we invite you in to a conversation with the silver throated mandolinist and mom, Sandy Lee Cherryholmes.